OJD is caused by the sheep strain of the bacterium Mycobacterium paratuberculosis, which leads to the intestinal wall slowly thickening, causing reduced absorption of nutrients from the intestine. 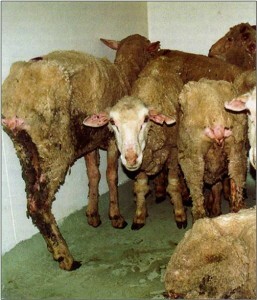 This eventually leads to severe loss of condition – infected sheep can waste away and die. OJD is often not diagnosed in a flock until a significant proportion of the flock is already infected and deaths are occurring. There is often no sign for the first few years – that is why it is often referred to as a ‘silent but costly disease’. Infected sheep can be shedding the bacteria in their manure for a considerable period (sometimes years) even though the flock still looks healthy, but they are contaminating the pasture and infecting other sheep. The classic sign of the disease in a mob is a distinct ‘tail’, with sheep ranging in condition from good to very poor, then the sheep in the ‘tail’ start dying. The number of sheep in this ‘tail’ may be constant but it’s made up of different animals over time, insidiously eating away at flock numbers and profits. The infected sheep continue to eat and drink normally until they are too weak to graze and eventually die. 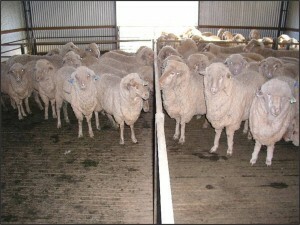 Scouring may occur, but is not a common feature of Johne’s disease in sheep. In some large flocks, the number of deaths may only be appreciated when big discrepancies occur in counts of adult sheep. When obvious OJD deaths are noticed, the disease is likely to be well established and it will take some years to get the situation under control, during which time deaths will continue. The best place to look for the disease is in two and three year olds, but sheep from weaners through to older adults can also die from the disease.